To keep your motivational mojo going, we here at FBG thought it would be fun to share the inside scoop on a few of our favorite things — from workouts to races to healthy eats. So if you’ve been wanting to try out a new healthy thing but are a bit intimidated or afraid to try it, have no fear, the What to Expect series is here! I was getting my hair done the other day when my stylist started talking about her weight-loss plateau. She belongs to a gym, so I asked her if she takes any group classes. “They’re not my thing,” she said. “I just don’t like them. I feel awkward!” As the most awkward Zumba-class lover in the world, I’m a firm believer that you don’t need to be coordinated or in superior shape to enjoy a class and get a lot of benefit out of it. But I totally get the group exercise hesitation. If you’ve never done one — or tried a few and hated them — it can seem intimidating. The workouts look (and sound) really hard. Everyone looks to be in phenomenal shape. So you just decide to go hit the elliptical again for another 30 minutes. There’s nothing wrong with the elliptical, of course, but I’m a believer that if you don’t like classes, maybe you haven’t found the right one for you. And I’m a firm believer that if you want to try them but are too intimidated to step through that door, then you just need a push to get there. 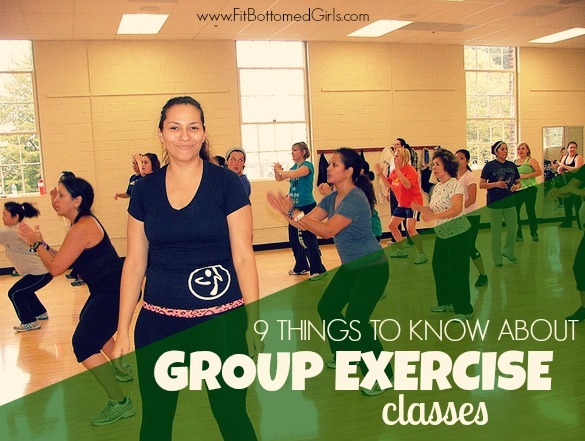 Because group classes are great for getting your out of your comfort zone, getting into a great group environment, and getting a push you might not get from working out on your own. Plus, they’re usually more fun than the elliptical. So for any others who have hesitations to join that class, read on! 1. If you haven’t found a class you like, you may have not found the right class. Say you took a dance class you hated. Or a yoga class that rubbed your chi the wrong way. Keep trying! I think of the very first group exercise class I took — probably a step class that had me super confused. If I had walked away from all group exercise after that, I would have been missing out on a lot of great workout fun. 2. If you think you don’t like a class, give it one more shot. Classes change from session to session. Plus, you get stronger from one workout to the next AND you’ll get better at anticipating what’s coming. So if you’re not a huge fan of a particular class, maybe try to give it another shot before you write it off altogether. You may find you love that dance class when you’re more comfortable with a few of the steps and a few faces start looking familiar. 3. You won’t love every instructor. Just like in everything else, there are great instructors and terrible ones. Ones who treat Pilates like boot camp, and some who you want to high five after a sweat-fest. Just like you may want to give a class a few tries before deciding whether you like it, it’s wise to give an instructor a couple of classes to see how they work with your workout philosophy. Unless they won’t stop talking about getting a bikini body, in which case I’d likely say adios sooner than later. 4. You’ll likely fall somewhere between the near-pros and the total newbies. Even if it’s your first class ever, it’s almost a guarantee that you won’t be the most in-shape person in class, nor will you be the most out of shape. Same with Zumba: you won’t be the best dancer, and you likely won’t be the worst. Just be you, and you’ll be just fine! 5. You can work at your own pace. I think people often skip group classes because they’re afraid they won’t be able to keep up with everyone. But here’s the secret: you don’t have to! And you likely shouldn’t, especially if you’re just starting out. Good instructors will give modifications as they go to make moves easier, and there is nothing stopping you from taking a water break or skipping a few reps if your arms are about to fall off. Group classes are great for pushing yourself, but you never have to work at a level that’s not comfortable for you! 6. No one’s paying attention to you. I used to fall into the “everyone’s watching me” trap, but not anymore. And if you think that way in group ex class, well, you’re wrong. People are way too busy watching themselves in the mirror to worry about you shaking your groove thang or dropping your weights two reps early. 7. Even when you’re in awesome shape, something new will seem super tough. You could be in amazing shape and run 10 miles without sweating. And I guarantee that a hard boot camp class will have you crying for mercy. Your body adapts to what you’re doing, so when you do something you’re not accustomed to, you will feel the burn. And that’s a good thing! 8. Sometimes the warm-up is the hardest. Seriously, I think some instructors try to scare people with their warm-ups. If you’re thinking, “If this is the warm-up, how will I survive an hour of this?” take heart. Sometimes when you make it through that first 20 minutes, you’ve made it through the worst of it. If you’re struggling halfway through a class, remember No. 5, and don’t hesitate to ask for modifications, skip reps or take intensity down a notch or two. No matter what, it’s still your workout. 9. The scariest part is the unknown. The one thing that holds even me back from trying new classes is the unknown. What will class be like? Will it be super hard? Can I keep up? Where do I put my stuff? But relax, it’s easy: Get to the gym a few minutes early so you can step into that room with confidence rather than running-late fluster. Find an out-of-the-way spot to throw your towel and water bottle. Stake out a spot — the back of the room is great so you can the instructor and the other participants. Tell the instructor or a fellow exerciser it’s your first time in the class and see what equipment you need to grab, if any. Experienced class-goers and instructors alike love to share their knowledge of the class. But the most important thing is to get yourself through that door, and I guarantee that you can handle what’s inside. You’ll learn something new, and you’ll be challenged in body and mind. I enjoy group fitness classes, but the first class and fear of the unknown is always the hardest for me to overcome. I LOVE group classes. It’s the only way I exercise, other than running, which I only do with a buddy. I love the regulars that I know really well now after 4 years at the same gym, and I love watching newbies come in and become regulars. I love the music, I love the energy and encouragement of the instructions, and I love how much harder I push myself when I’m in a group setting (though I DO drop the weights or take a water break if I need to). Group classes are a great way to switch things up and use social motivation to keep yourself going! I totally agree with so much of this — there are classes out there for anyone and everyone! There are so many different types and kinds, so many different instructors with different styles… so, like you said, it’s important to not give up based on one or two bad experiences! A good instructor will be able to accommodate all levels of experience, so try out several till you find someone you like! Group fitness is all I do and the only way that I got into shape. After group fitness, I learned that when I worked out before on our elliptical in the basement by myself, I was at about 30%. On your own once it gets a little tough it is sooo much easier to pull back rather than really push yourself. group classes aren’t my preferred way of working out (I’m a workout DVD girl) and I tried a few that I just didn’t like. however, I have found a few that I enjoy (a particularly awesome yoga class, pure barre, etc) that are helpful to switch up my usual DVD routine. I try to go to at least 1 class per week and then do DVDs the rest of the time. I attend a few different group classes at my gym and try to be welcoming to newcomers especially at the beginning of the year when the new Resolution folks come in. One friendly smile might be the difference between someone feeling foolish and leaving vs falling in love with the experience and becoming a new exercise junkie! I have never really tried a group class before, and like GF I usually do workouts at home from a DVD but I have been thinking about trying some so thanks for clearing the air a bit about them. I was a little hesitant but I think I will definitely give one a try! Thanks!! I’ve discovered that after years of trying different forms of exercise– walking, the machines at the gym, tennis– that my zumba class is the one thing that I have been able to stick with consistently over time. It also helps that my zumba instructor is energetic and the class is fun. Best of all, I get a GREAT cardiovascular workout from it!